When I was in Vancouver in 2001, I found a kindred spirit in the form of Mason. He’s almost singlehandedly responsible for about 95% of the Canadian music that I have in my collection…introducing me to the New Pornographers, Mass Romantic. His recommendations and the CBC Radio 3 Podcast have informed and developed my Canuck-o-phile instincts, to the point that I shamefully know more about independent Canadian music than Australian stuff. Anyhow, we’ve kept in touch, although we haven’t actually spoken or met in person since Vancouver. Since I’m too lazy to compile my own best albums of 2007 list, I’ll point you towards Mason’s most recent blog post concerning the best albums of 2007. There’s a podcast in mp4 format where you can listen to an example track and hear Mason and Jehan’s opinions about some of the tracks, amongst others. It’s entitled “Hiptarded Podcast #1” which hints at the prospect of more in 2008. I wait with bated breath. As for the selection, I’m not au fait with a majority of the albums, although I was familiar with more of the albums on his shortlist. I must say, from the Jamie T tunes I have heard, I have built up a natural aversion to him though. His reputation as the male Lily Allen reinforces that; I dont share Mason’s enthusiasm for her either. I have to admit, I’m a bit of a curmudgeon when it comes to discovering new music…I’m pretty “anti” the music press, so you’re less likely to find many bands championed by the NME or similar publications in a Ed generated favourites list. The same goes for BBC Radio 1. I tend to think that taking a bit more time to dig deeper and not just accept the artiste du jour as decided by the payola-esque music industry is a better idea…YMMV. I’ve been like that for years, just replace Radio 1 with Triple J (Australia) and the NME with…well the NME to see what I mean. By the way, a couple of albums that I would have thrown into the mix that Mason didn’t mention are Hvarf-Heim by Sigur Rós (which I guess isn’t technically a new album) and Last of the Chanranguitas by The Epstein (Oxford’s answer to Calexico). Here’s a flavour of Saturday’s show at Brixton Academy, as mentioned in the last post. 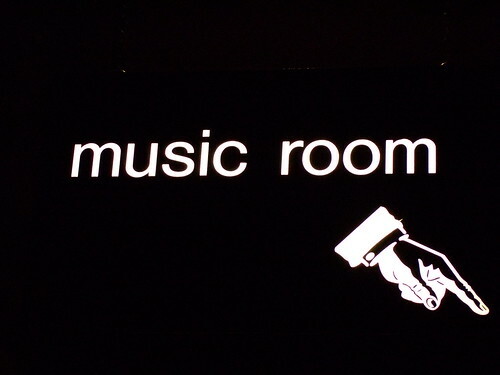 It’s a song called Neighborhood #3 (Power Out) from Arcade Fire’s album Funeral. The other photos are here. In another display of my Canuckophilia, I went and saw Montréal based, Arcade Fire perform at the Brixton Academy, last night…and it was frieking great! A great end to a great day. 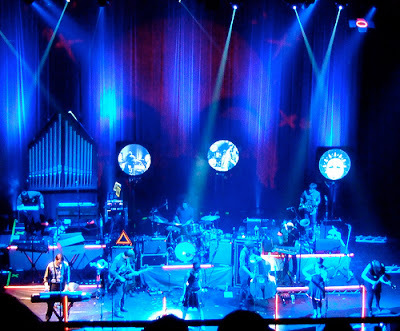 From Oxford Fire to Arcade Fire in the space of 24 hours…what a convenient segue! I went to see Metric play at The Zodiac here in Oxford on Sunday night. 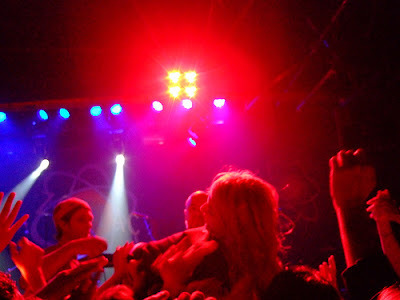 It was a great show, capped off by an energetic stage-dive by Emily Haines, as can be seen in the pic above. I was just out of range from being jumped on, so I fished my camera from my pocket and was able to get this mainly in focus shot. My friend Nick is a huge Metric fan. When I was in the gents, I spotted a discarded YYZ (Toronto)-LHR (London Heathrow), Air Canada baggage tag and gave it to him as a joke. I later found out that he got it signed by the band…lol. What a Beaver Tail is. The tune of and a good chunk of the words (in English) to Oh Canada. At work I have a maple leaf coffee mug, when it’s slow at work I sometimes listen to CBC Radio 1 via the Internet and my favourite outdoor store is the Mountain Equipment Co-op. I also once stayed up all night to watch the Calgary Flames play in a Stanley Cup game…although I admit that my love of hockey isn’t such that I would hurry to do that again. I admit it, I’m a Canuck-ophile. I also listen to quite a bit of Canadian music. This all stemmed from my time in Vancouver when I met Mason, who now works at This Magazine in Toronto. Check out his blog, which looks great after a make-over. Mason first played me the music of The New Pornographers, amongst others. Their show at The Borderline in London was the best that I went to in 2006…well equal with Broken Social Scene at The Zodiac. They are also Canadian. I met Anne-Marie after eavesdropping on a conversation about Calgary on the Oxford Tube bus. She used to play me Canadian music on the stereo of the Phoenix Cinema bar, where she used to work and tell me stories about working on Canadian indie movies, once dating the bass player from The Arcade Fire and working on a New Pornographers video shoot. The last time I went to Canada was in 2005, when I visited Anne-Marie in Montreal. Before leaving, I emailed Mason and got him to send me a list of CDs I should check out. He doesn’t know this but I ended up buying every CD I could find on his list, spending about $250 in one go. His list actually duplicated many of the artists that I’d heard on the CBC Radio 3 podcast. I highly recommend this weekly podcast as they play a wide variety (not just indie rock) of great music. The host, Grant Lawrence has an enjoyable announcing style too, in my opinion. I don’t always get a chance to listen every week, as the podcast is usually an hour long or there abouts. I do get iTunes to download it every week though and get to catch up on journeys to London or long train journeys to Scotland. There is really some fantastic music of all genres coming out of the Great White North. Australia’s radio equivalent, Triple J FM could really learn a thing or two from CBC Radio 3. Triple J have podcasts and now and again, I have a listen to popular scientist, Dr Karl Kruszelnicki, but there is nothing that I know of that showcases Australian bands as well as the CBC Radio 3 podcast does for Canadian artists. I liked Triple J a lot better before they sold out in 1990, anyway! Viva 3RRR-FM!! Coincidentally Dr Karl’s last name is the same as another British-based Canadian I know, Dallas Kruszelnicki. He’s a musician, yoga instructor and former guitarist of The Dirtmitts. Anyway, that’s enough proselytizing about Canada for now. Time to ski Mt Mattress.